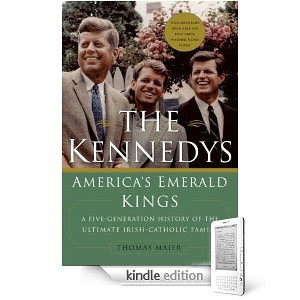 Thomas Maier Books: New Miniseries Isn't "The Kennedys"; Read The Book Instead! 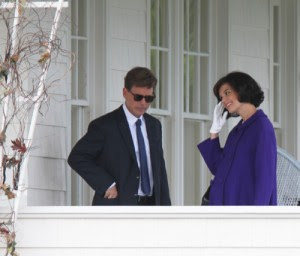 New Miniseries Isn't "The Kennedys"; Read The Book Instead! Earlier this year, a plethora of Kennedy historians condemned this new mini-series after they got a look at the early drafts of scripts. Supposedly, they claimed, this miniseries will be a hit job by its conservative producer. Looks to me, if anything is afoul, that this new miniseries will resemble those old ABC TV Movie of The Week productions, where Jack, Jackie, Bobby and the gang would be better played by marionettes. More so, I'm afraid that, in this time of Obama, the essential minority status of the Kennedys as Irish Catholics looking to grab the brass ring of the White House will be whitewashed. Instead, we'll get another American Camelot production, with Kinnear wearing Ray-Bans and Jackie in pearls as the major insight. Anyway, kids, to get the real insight on the Kennedys pick up my version, "The Kennedys: America's Emerald Kings", still available on Kindle, IPad, paperback and hardcover from Basic Books. This book has the real scoop about Jackie's reaction after the assassination, the ties of the Kennedys to the Vatican and even the story of the Kennedys in Ireland. The Boston Globe said it the best book about the rise of the Kennedys in Boston, and Publishers Weekly said it should replace Doris Kearns Goodwin's tome on the family. So as Honey Fitz used to say, 'Vote for 'The Kennedys' The Book and don't accept any substitutes!"